So I'm reading my Wall Street Journal this morning and there in an eye-catching ad I see that the world's finest super premium vodka has a brand name: Trump. Yes, you can now buy Trump Vodka — and when you drink it, you can peer over your martini glass and whisper, "Tastes like money." I know Donald Trump — a little. He always has a friendly greeting for me. But Donald, isn't this a little much even for you? Because if I'm not mistaken, you don't drink — I mean like teetotaler doesn't drink. 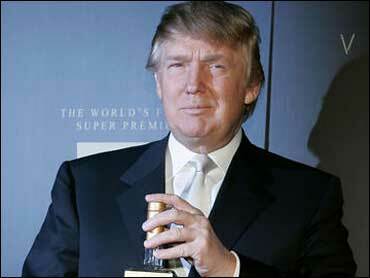 In its own way, I'm sure Trump the vodka extends Donald's brand, which is what business is all about these days. But what happens if I drink Trump Vodka and I don't get rich? What if I begin to stew and I start to contemplate that I'm never going to have a private jet? It's a bad image: Losers ordering another round and cursing the day you were born. This may be one branding opportunity too many.